Author Written by Velmurugan Saravanavelu and last updated on Posted on November 30, 2017 . 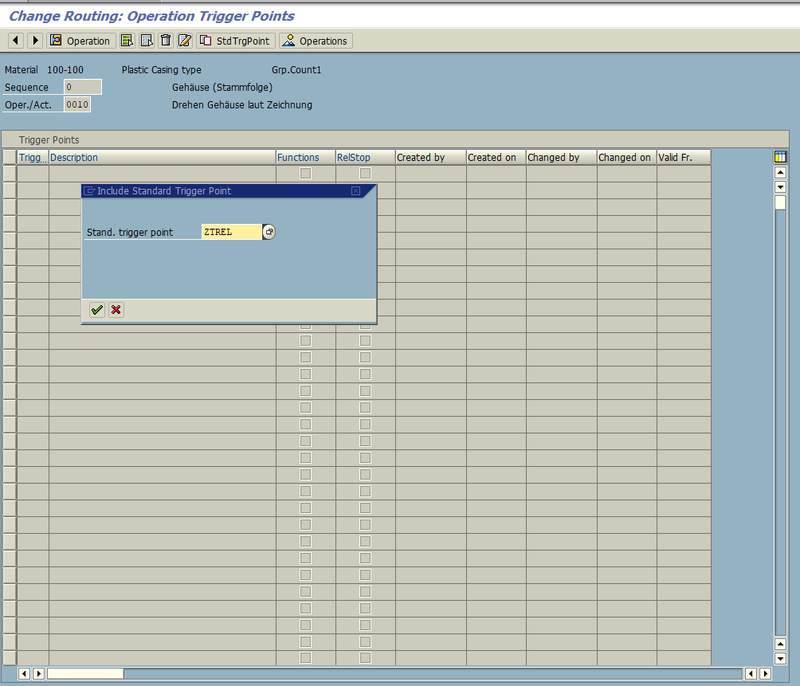 Welcome to the tutorial about SAP trigger points in Production Planning module. 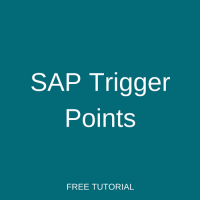 SAP trigger point is an object which is assigned to an operation in routing in order to trigger a certain function. 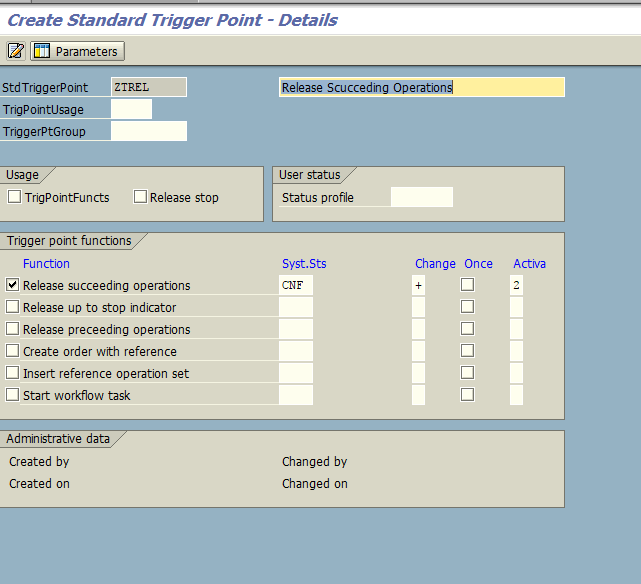 We can trigger certain business functionality using SAP trigger points when an operation or a production order statuses are getting changed. For example, we can trigger workflow to production manager when scrap is recorded in the production or we can create another order or operation when rework is recorded, etc. 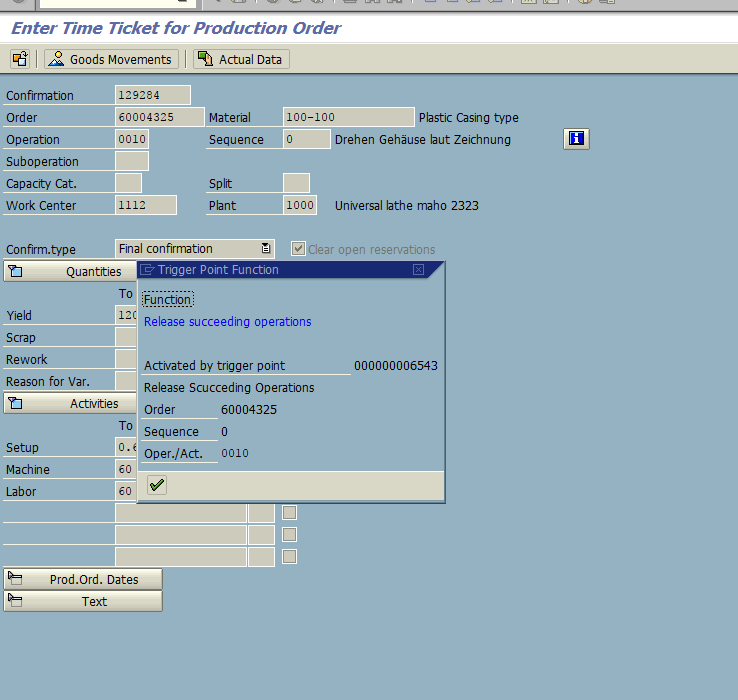 We can trigger production order relevant functions based on production order status (system or user) only. Here, status is updated when different business functions are performed like Create Order, Release Order/Operation, and Confirm Operation. As these actions are executed by a business user, SAP system updates the status to the operations and the order. These statuses are called “system statuses”, i.e. 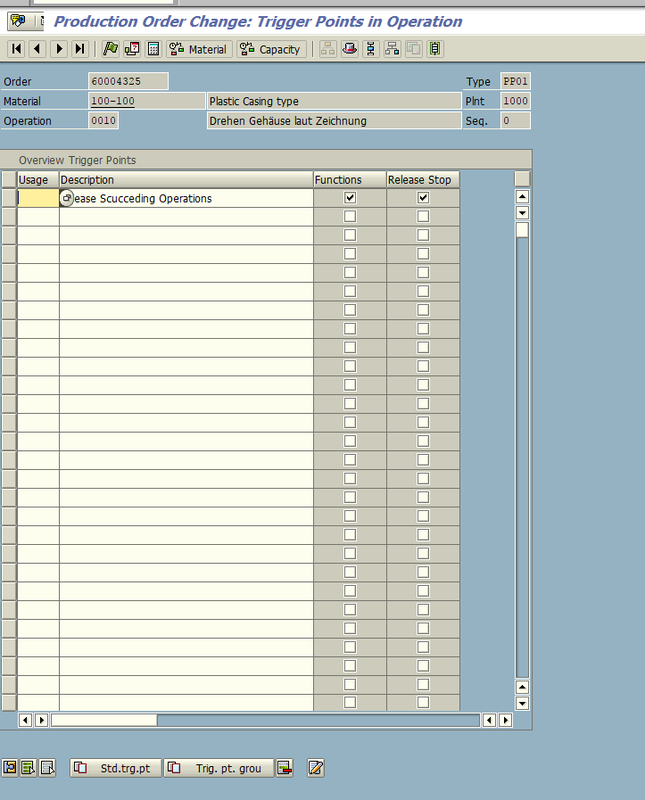 statuses set for the operations/order automatically by the SAP system based on functions executed for the operation or the order. Apart from the system statuses, we can also define our own status which are called “user statuses” and they are based on the business process. Let’s look at the example of production statuses. Below is the standard production order sequence. 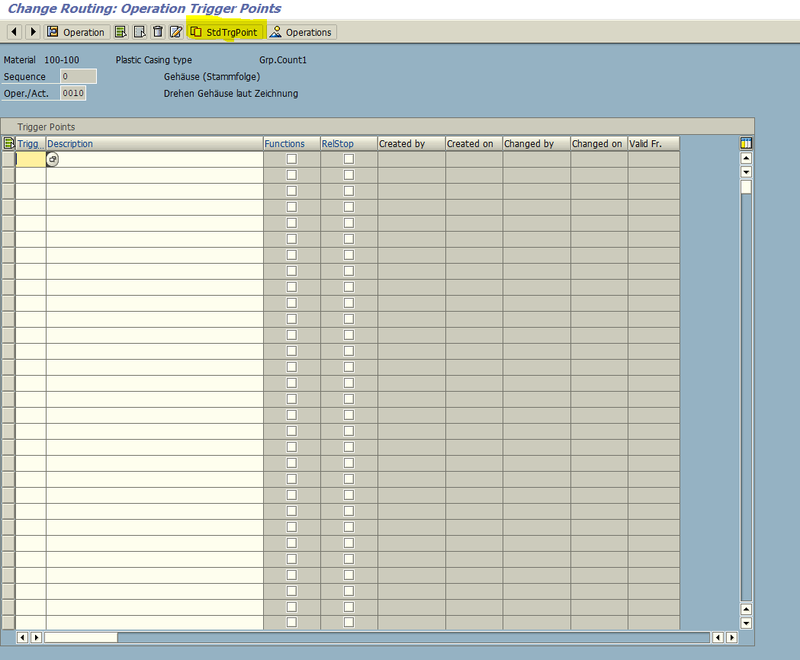 Now, let’s discuss how to create SAP trigger points and how to assign them to operations in SAP PP routings. In this example, succeeding operations will be released when a preceding operation is confirmed. This will be done using a trigger point. Please follow the path in SAP Easy Access menu shown on the screenshot below to start the transaction for creation of SAP trigger points. Here are the fields available on this screen and their description. 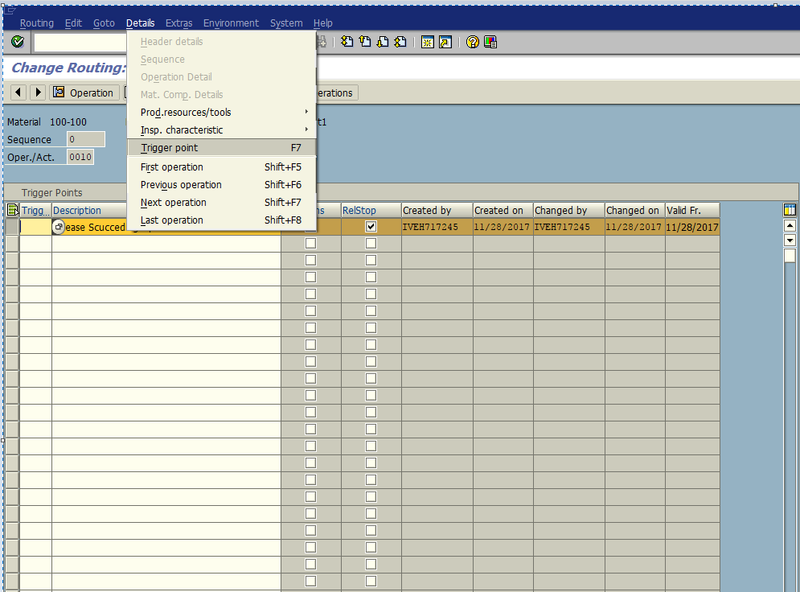 Usage: We can group trigger points with similar function using this field. 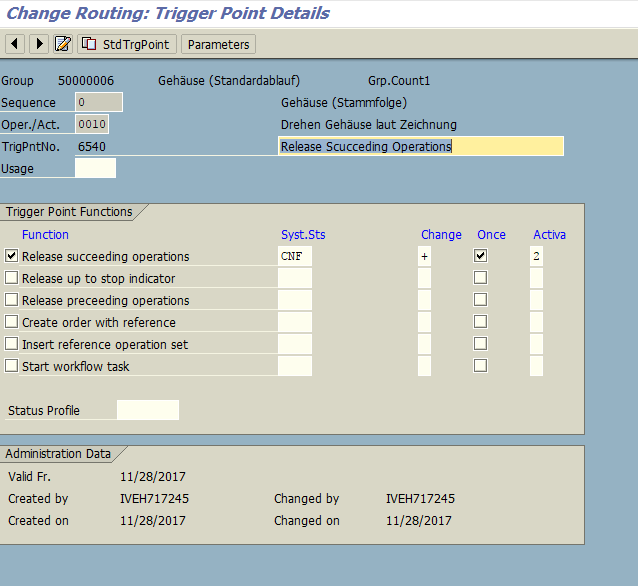 Trigger Point Group: We can group SAP trigger points with different functionality into one group and assign it to routing operations. This field is optional. User Status Profile: It is only required when you want to execute/trigger functionality by user status instead of system status. Let’s say you have operation sequence: OP01 -> OP02 -> OP03 -> OP04. As per the production process, operation OP02-OP04 should not be started unless OP01 is completely done. In that case, we can define the trigger point as shown below. When system status of the first operation (OP-01) is changed to CNF (fully confirmed), the trigger will perform the function. If we set “Once” checkbox, then it the function will be performed only once. Here, the function is to release the succeeding operations (OP02 to OP04). 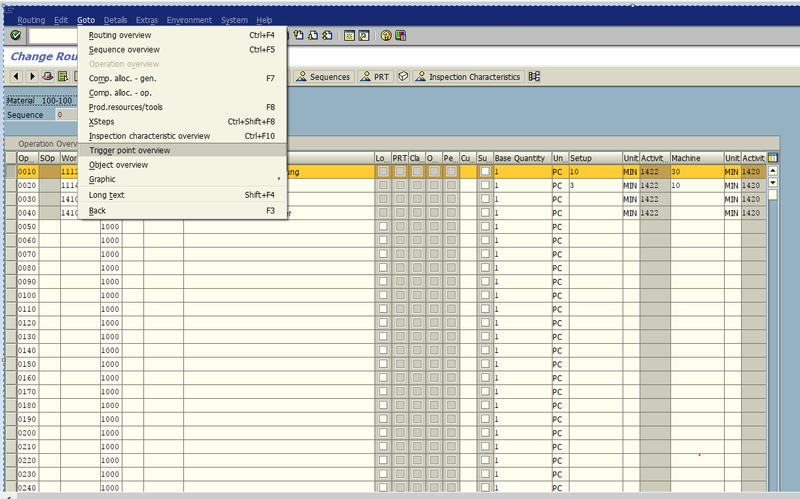 This function can be done automatically by the SAP system or manually. This setting is controlled by “Activate” field. You can see possible options for this field on the picture below. Now, go to transaction CA02 (Change Routing) and access operation overview menu after selecting the operation for which you want to assign the trigger point. 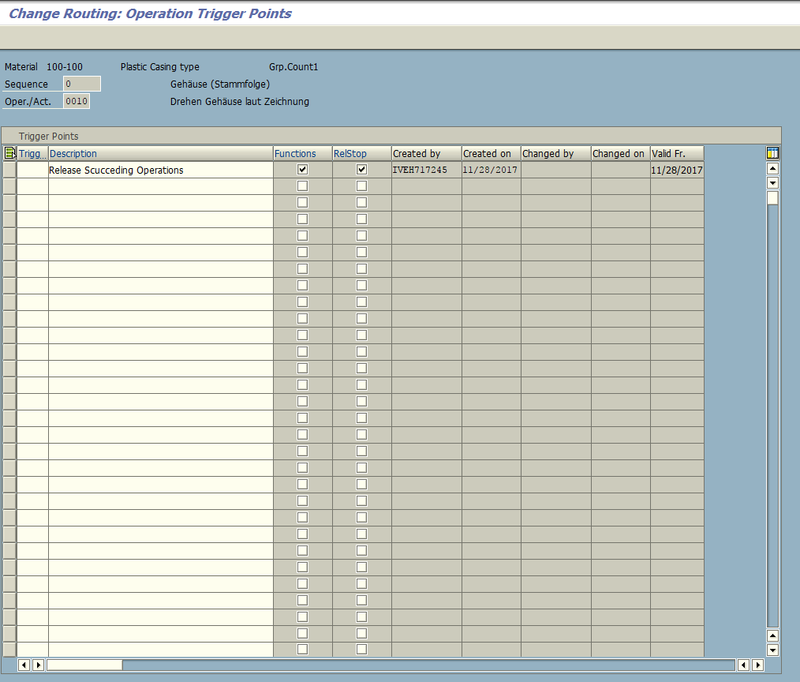 You will see Operation Trigger Points overview screen. Click on button to copy the trigger point created previously. You will see the screen with the details of the operation similar to the one that we saw when created this trigger point. Now, go back and save the routing. 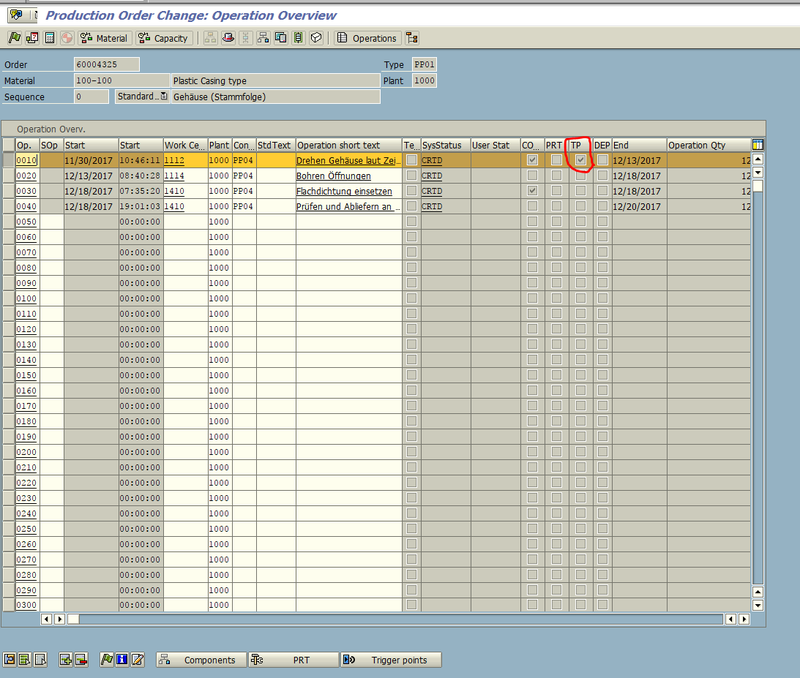 Let’s see the behavior of our trigger point during execution of a production order. 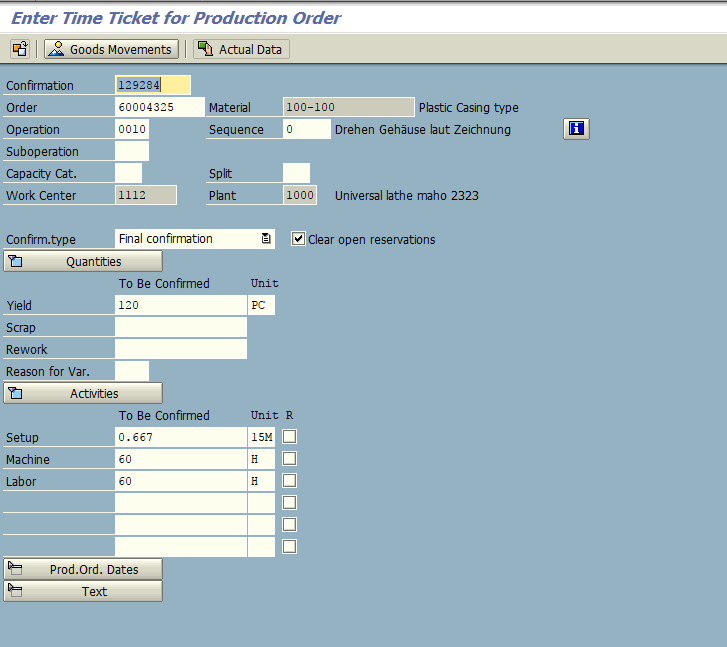 The detailed process of production order execution will be explained in forthcoming tutorials. The idea of this small example is simply to show how the trigger point is used in production order based on its status. For the time being, don’t worry about unfamiliar transaction codes and menu path. You can see that the trigger point is assigned to operation ‘0010’ in the Production Order Operation Overview. By clicking the icon , we can see functionality of this trigger point. 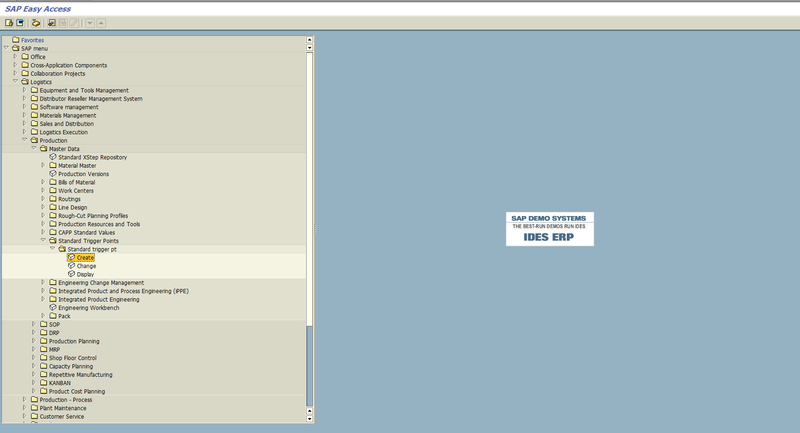 Now, look at the system status of each operation which is as “CRTD”, i.e. created. Now, we will release the first operation where the trigger point is assigned. Here, you can see that except the first operation all other operation statuses are still “CRTD”. Only the first operation is having status “REL”. When we save the first operation, the system will show Trigger Point Function window. Now, you can observe the status of the second operation in the order which was automatically released by the trigger point. The status “REL” was set for it. 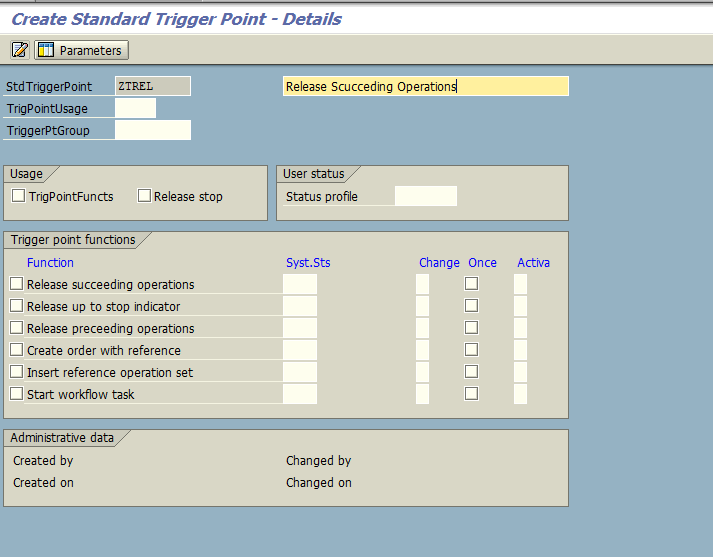 This example illustrates how SAP trigger points can be used to perform certain functions (in this case, release subsequent operations) in production orders. Excellent document sir.One question can I use this functionality in Repetative process ? Thank you,One suggestion please how can I classify same plant with different work centres for two different report generation through STANDARD SAP Business Process? How to assign trigger point to group in mass?